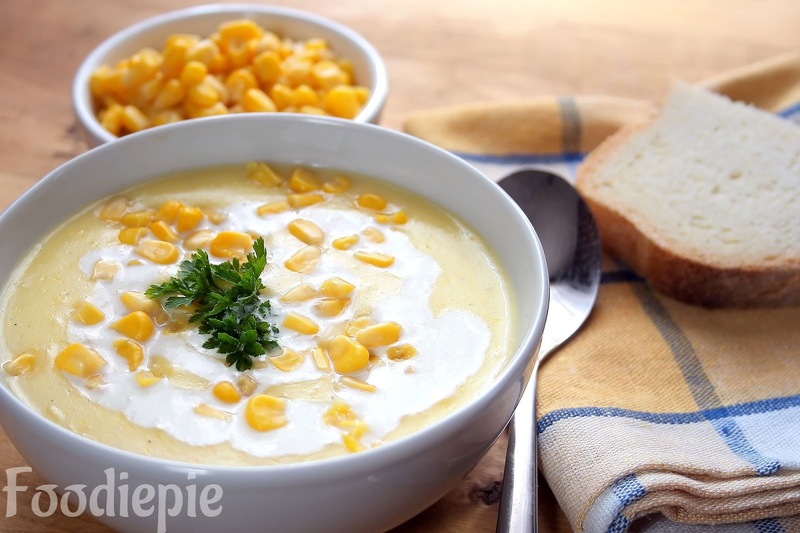 So Today we learn that how to prepare homemade healthy Sweet corn soup at home with simple steps.Let's checkout recipe first. Step 1 : Add 2 cup of water in pressure cooker and add corn, salt.Let it boil for minutes or 2 whistles over medium flame. Step 2 : Turn of the flame. Wait for cooker release pressure/air naturally.it will take around 5-6 minutes. Step 3 : Drain all the water and transfer corns to plate and leave them to cool for a minutes in room temperature. Step 4 : Take a bowl and add 1/2 teaspoon cornstarch(corn flour) in 1/4 water and mix well. Step 5 : Add boiled corns in mixer jar and add 1/4 water and make a smooth puree.Avoid thicker puree.If puree is thicker add water as required for smooth puree. Step 6 : Heat a 1 teaspoon butter in pan over low medium flame and finely chopped green onions and chopped carrots.Cook for a minutes or until it turns into golden brown. Step 7 : Add Corn puree and mix all well.stir continuously and cook for 2/3 minutes over medium flame. Step 8 : Now add remaining 1/2 cups boiled sweet corns kernels. Step 9 : Add 2 cup of plain water or vegetable stock and add black pepper powder and pinch of salt(before adding salt at this stage taste the soup mixture if required then add). Step 10 : Stir continuously and cook for around 4-5 minutes over medium flame. Step 11 : Now add cornstarch mixture water which we make in step 4 and mix well with spoon for minutes for preventing lumps. Step 12 : Stir continuously, cook for 5 minutes until mixture turns ticker.turn of the flame. Finally : Transfer to serving soup bowls Healthy Sweet Corn Soup is ready garnish with coriander leaves and green spring onions. Topping with cream for more texture and taste.